The second season of Mahila Premier League (MPLII) started on September 15th at Grassroots Recreational Center in Mandikatar. 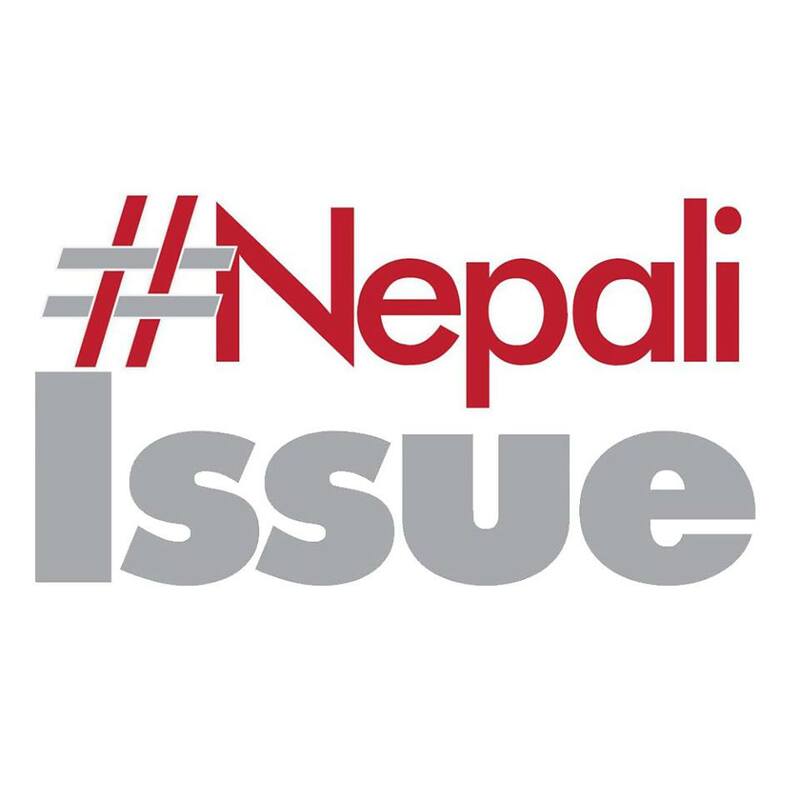 MPL is Nepal's first women's futsal league; funded by the European Union in Nepal, organized by The WE United Project, and supported by many local businesses. The League is a fully women-run initiative: played by women, organized by women and refereed by women. Over the course of eight weeks, eight teams will compete for the title of Kathmandu's best women's futsal team in order to promote a culture of competition, camaraderie, and collaboration in Nepali women's futsal. League games will be played on Saturdays until November 3rd. After Dashain break, MPLII resumed with much enthusiasm and energy. A total number of 34 goals were scored during the seventh week, bringing the total number of goals scored to 295! 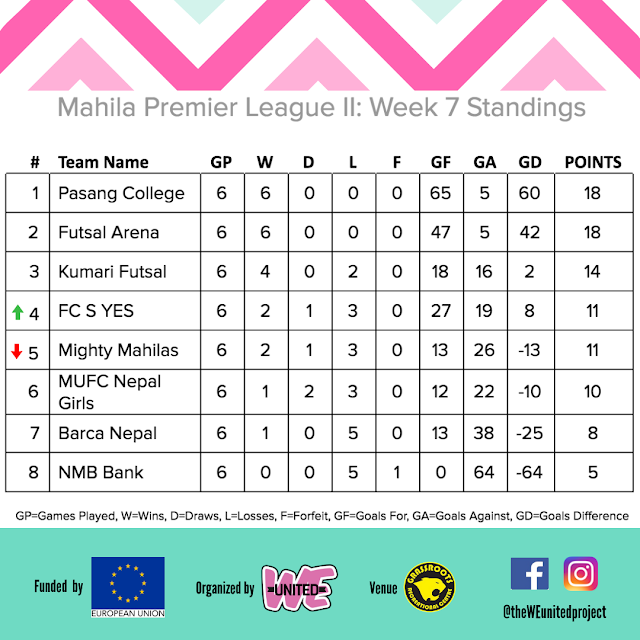 Pasang College maintained its position on the top of the table after defeating Mighty Mahilas this week 7-1. Despite their loss against Pasang College, the Mighty Mahilas showed astonishing defense skills and sportswomanship. Pasang College and Futsal Arena lead the League Table with 18 points each; however, Futsal Arena is slightly behind due to a goal difference of only 18. Sunkala Rai was able to successfully maintain her position this week as a top goal scorer in the Mahila Premier League with a total of 31 goals. In the 7th week, MUFC Nepal Girls made a comeback with their first win in the League against Barca Nepal, 5-1. “It was our first win for MPLII and I am proud of my team for supporting each other and for all the encouragement,” said Sumita Karki of MUFC Nepal Girls. The game between MUFC Nepal Girls and Barca Nepal was extremely engaging, and it was evident that both teams have improved over the course of MPLII. FC S YES is in fourth place with 11 points after their win against NMB Bank this week, 15-0. Kumari Futsal battled Futsal Arena in one of the tougher games of the League this week, with Futsal Arena ultimately winning 4-2. 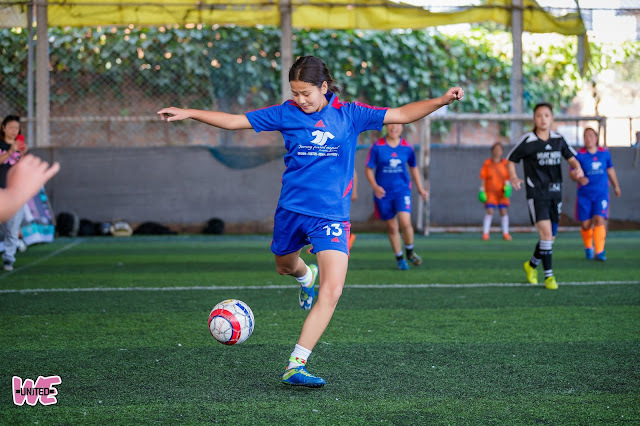 “We have lost and also won games throughout MPLII; however, what matters the most is to continue playing and learning,” said Kansu Tamang from FC S YES after her team’s victory. With only one more week of play to go, the teams are more excited than ever. 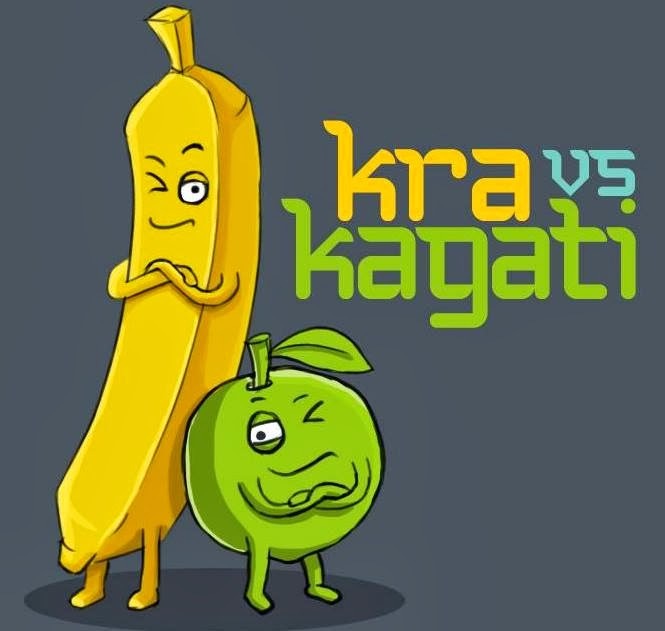 Next week Pasang College and Futsal Arena will be going head to head in one of the most anticipated games of the season; it will be a battle for the championship! Mighty Mahilas and FC S YES will also be going head to head in a game that will determine the fourth and fifth place teams. Great prizes from The WE United Project’s local business sponsors will be provided to first, second, and third place teams at the Award Ceremony following the last of the league games on November 3rd. Nistha Thapa Shrestha is the Project Coordinator for Mahila Premier League.